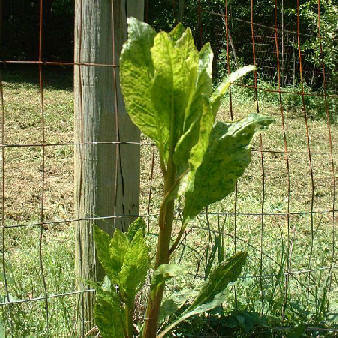 Poke Salat Festival - Pokeweed? How did the Festival get started? The Poke Salat Festival was first held in 1984. Located along the sidewalks and streets of Historic Downtown Arab, the Festival was started by the "Liars Club", a group of men that frequented the L'Rancho Cafe - where you can still get a taste of the greens each May during the Festival. Along with Arts and Crafts, the Festival offers a food court, children's games, demonstration and interactive booths, bake sales, civic groups, an annual pet parade and lots of entertainment. Beginning in 2017, the Festival is home to the Poke Salat Bluegrass Band Competition - held on the Saturday of the Festival - which features bluegrass music all day. The Festival, which is hosted by the Arab Downtown Association, in conjunction with the City of Arab and the Arab Chamber of Commerce, centers around the Poke Salat dish, which is derived from the Poke Weed plant. Just what is poke salat? Pokeweed. You’ve probably seen it growing wild in pastures, snaking up through fence lines or out in the woods. As a kid you probably played with the berries of the pokeweed, dying your hands with a deep purple that you had to live with for days since it wouldn’t wash off. Sure it grows wild, but is poke just a weed??? Not to the thousands that live on Brindlee Mountain. During the early part of May, the folks around Brindlee Mountain gather in the streets of downtown Arab to celebrate Poke Salat. But no matter how it derived its name, folks in Arab think it’s worth celebrating... So, whether you call it salad, poke, or poke greens, just come eat your fill at the next Arab Poke Salat Festival!